With the increased popularity of fireplaces, particularly log burners, it’s no surprise that the demand for high-quality fire surrounds is also on the rise. However, with so many different materials to choose from, it can be extremely overwhelming when you first start searching for your dream fireplace surround. When it comes to fire surrounds, you can’t really go wrong with stone. Offering a stunning aesthetic that can compliment both modern and rustic interiors alike. 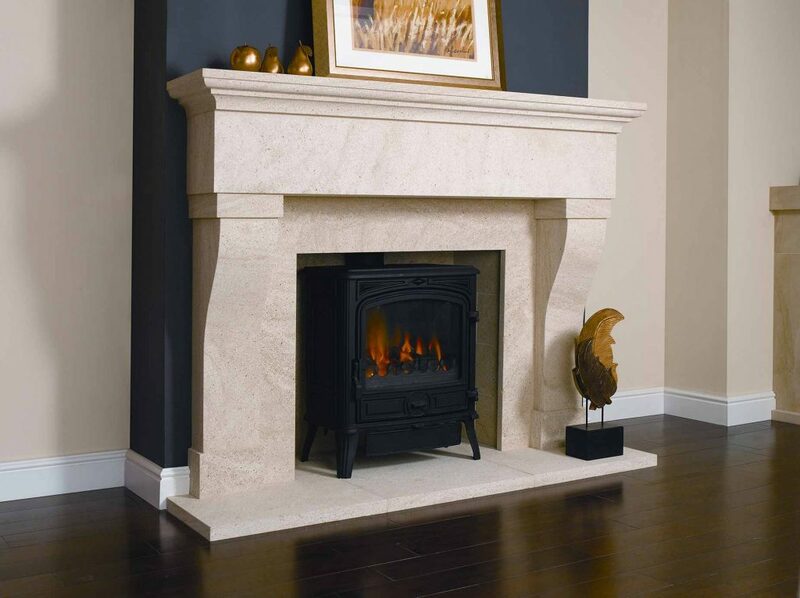 Grand in design and used for over 300 years within the fireplace industry, stone is renowned for its longevity. Crèma Argel is a stylish stone, typically used for modern fireplaces due to its colour, texture and shading. 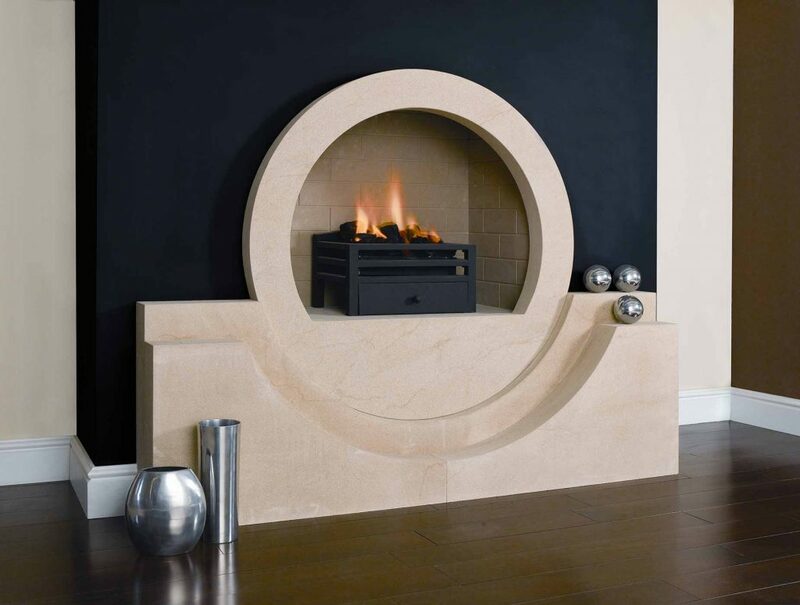 Ideal for those wanting a rounded shaped fire surround, examples include our Boston fireplace, Balmoral and Warwick. Sandstone is a more favourable choice for those that want their fireplace to have a sharper and finer grain of stone. We have an array of popular handcrafted sandstone designs, such as the Stamford, Chiswick and Ledge. A stylish stone that is popular as a result of its stunning grey/blue colour is Azul. Perfect for those wanting their fire surround to potentially match the theme and colour of your room. Popular Azul fireplace designs include Devon, The Milan and Spectrum. Wood fireplaces are especially popular in country-themed homes, due to the stylish and rustic designs available. The vast array of customisable features of wooden fireplaces makes them extremely appealing. Colour and staining options allow you to tailor your fireplace to match the theme/colour of your room. If you are looking for a contemporary fire surround, brick offers a unique style that is unmatched. Similarly to wood, a brick surround looks particularly wholesome within a country-themed household. Brick fire surrounds are also relatively easy to maintain. What Size Should My Fire Surround Be? The answer to this question will depend entirely on the size of the appliance/stove that you wish to install. This decision will also be influenced by the heat output that will be required to heat up your room. The design/structure of your room will also be another factor to consider, depending on whether you are looking for a subtle surround, perhaps, you want your fireplace to be the focal point of your room. If this is the case, you’ll be wanting a colossal surround that is designed to attract attention. It may be worth speaking with our experts if you’d like any advice regarding sizing. How Do I Maintain My Fireplace? When it comes to maintaining your marble fire surround, it is best advised to use warm soapy water and then finish it off with a wax polish. You can typically brush away any dirt from these types of fire surrounds. If there is a scuff on any brickwork, it is recommended that you use a caustic cleaner. When it comes to slate and granite, liquid detergent is an ideal method of cleaning the fire surrounds. Whilst these types of fire surrounds can be somewhat of a nuisance to maintain, their stunning appearance is unmatched. Typically, you’d clean your sandstone/limestone with a pH-neutral stone cleaner. However, we’d suggest consulting our friendly team if you would like any more advice when it comes to maintaining your sandstone fire surround. If you still have any questions or would like further advice about choosing your dream fire surround, the friendly team here at Firecraft are always available to help. You can call us on 0116 442 2703 or by filling out an online contact form.